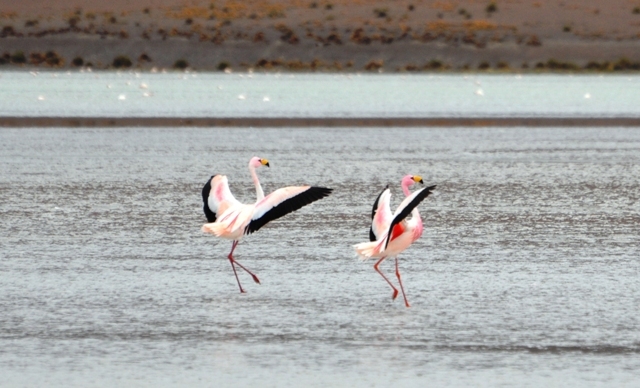 If you love pink flamingos, you need to visit Bolivia! 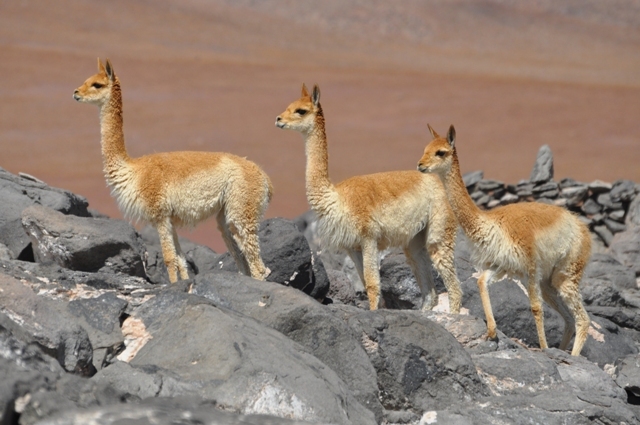 Wikipedia - The Eduardo Avaroa Andean Fauna National Reserve is located in Sur Lípez Province. Situated in the far southwestern region of Bolivia, it is the country's most visited protected area. It is considered the most important protected area in terms of tourist influx in the Potosí Department. 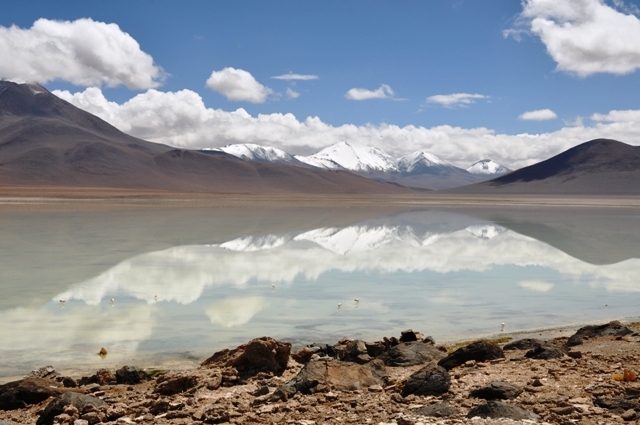 Located at an altitude between 4,200 m and 5,400 m] in Bolivia, it extends over an area of 714,745 hectares) and includes the Laguna Coloreada National Wildlife Sanctuary. Categorized under IUCN Category IV, it is primarily for the protection of birds that inhabit the different lagoons in the reserve. The reserve protects part of the Central Andean dry puna (oligothermic) ecoregion. 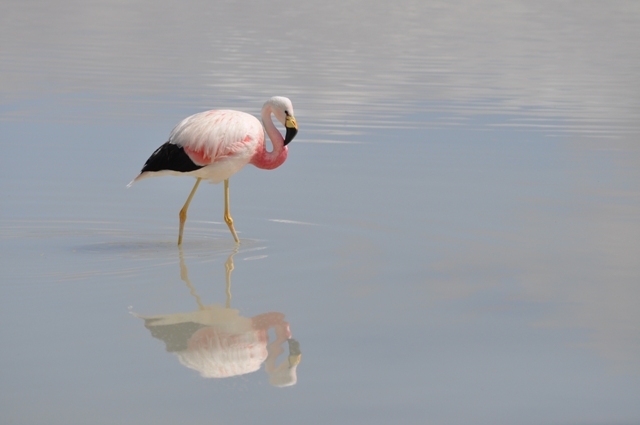 The reserve's major attractions are erupting volcanoes, hot springs, geysers, lakes, fumaroles, mountains and its three endemic species of flamingos in particular. Wikipedia - Flamingos often stand on one leg, the other tucked beneath the body. The reason for this behavior is not fully understood. Recent research indicates that standing on one leg may allow the birds to conserve more body heat, given that they spend a significant amount of time wading in cold water. However, the behaviour also takes place in warm water. As well as standing in the water, flamingos may stamp their webbed feet in the mud to stir up food from the bottom. 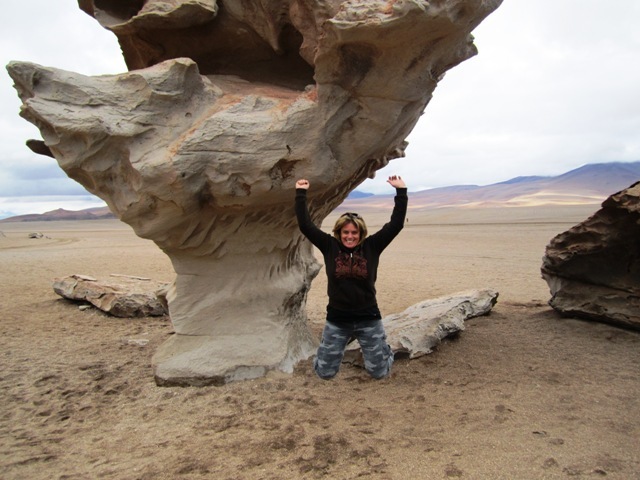 Excerpt from the book Soul Searching in South America from the Teresa the Traveler series. First thing in the morning I dragged my luggage through the muddy streets of San Pedro for the last time and waited at the pickup location for the bus and that’s where I met Mickey and Sarah – a couple from Ireland. On the bus we met a couple from France and a girl from Turkey and, since the six of us were the only English speaking people on the t, by the time we reached the Bolivian boarder we had become fast friends. 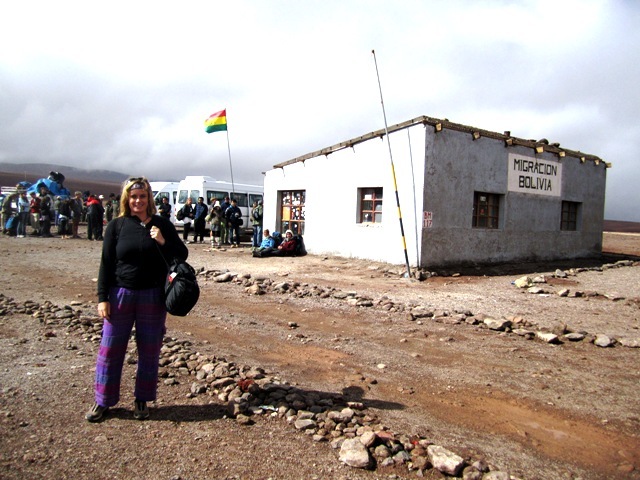 The Bolivian immigration office was modest to say the least. Considering Bolivia is one of the least developed countries in South America with over two-thirds of its people living in poverty, I guess this was to be expected. 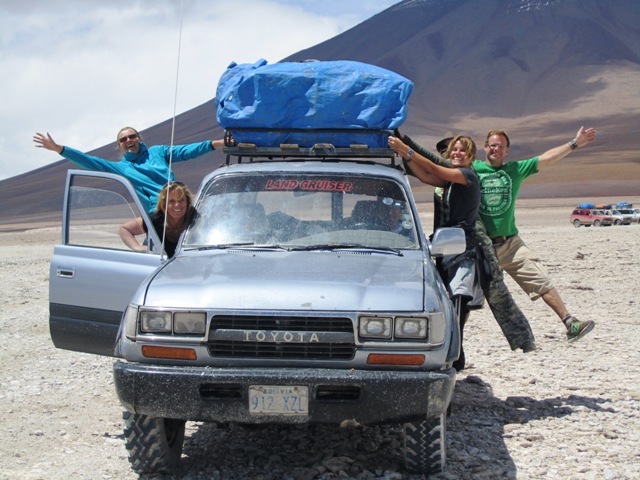 After we had our passports stamped, a group of Bolivian tour guides, each driving a Land Cruiser, met us at the border where we split up into groups of six for the remainder of the tour. Needless to say, the six of us migrated to the same vehicle. I was thankful to be in an all-English speaking group…it is not as much fun when I’m not able to communicate well with the other people on my tour. We drove from the border to the entrance to Eduardo Avaroa National Park where we purchased our passes before visiting the White Lagoon for our first glimpse at the beautiful pink flamingos that inhabit all of the desert’s lagoons including the Laguna Verde, Laguna Altiplanicas and Laguna Colorada. The geysers Sol de Manana were one of my favorite sights on the first day. Despite their name they are not in fact geysers rather they are part of a geothermal field extending over an area of 10km². 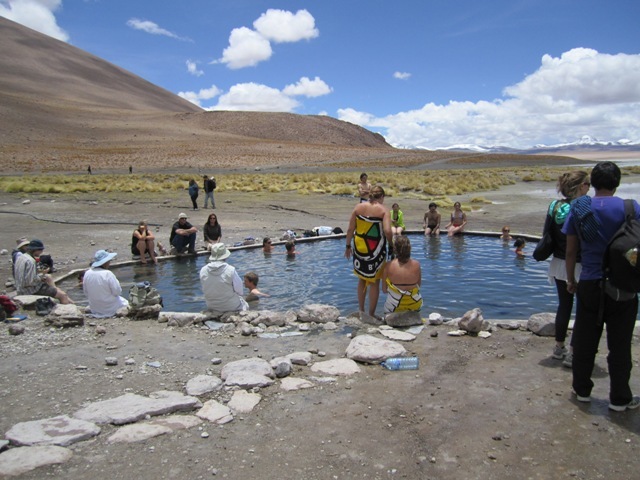 The sulfur springs field consists of mud lakes and steam pools of boiling mud. 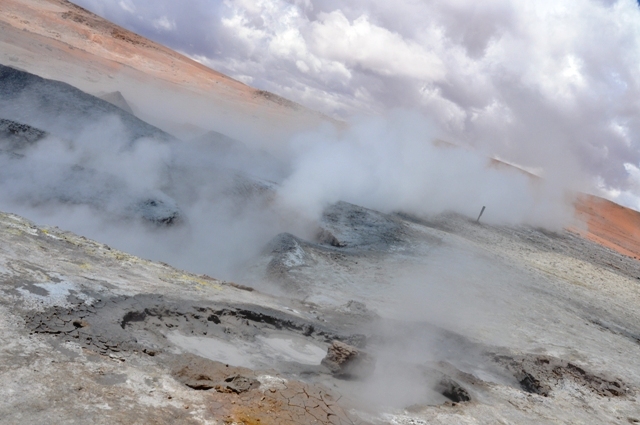 Several holes, which are referred to as geysers, emit the pressurized steam, however a true geyser emits water. Unfortunately the cold wind and rain prevented us from spending too much time at this magnificent site. Day one ended around 4 pm when we pulled up to a hostel nestled beside yet another lagoon filled with pink flamingos. Rocco had warned us that the accommodations for the first night would be pretty rough but I had no idea just how rough they would be. The six of us all had to share a room with no heat and barely any electricity save for a single dull light bulb. The French couple shared a rickety bunk bed that squeaked all night while the rest of us got single beds covered with heavy red and yellow children’s bedspreads with pictures of teddy bears and elephants. The coed shared bathroom had three toilets that did not flush. Toilet paper was to be thrown in a trash can and people were required to fill a jug with water and pour it into the toilet until your deposit disappeared. It looked and smelled nasty and did not come with a shower…not that I would ever want to take shower there. I knew it was going to be a cold uncomfortable night and it was starting to get me down. I needed to find a way to lift my spirits and entertain myself for the evening without the luxury of internet or television. After dinner, the group was sitting in the cold dining room drinking beer when it occurred to me this was the perfect time to pull out my travel guitar. I had been dragging it around for over a month and barely played it. I was starting to regret my decision to bring it along. Considering we were from all over the world, I had no idea what songs people would recognize. I sang some Kid Rock and Poison but no one sang along. One of my favorite all-time artists is the late-great Man in Black Johnny Cash so I decided to share his music with the group starting with my rendition of Folsom Prison Blues. I certainly wasn’t expecting anyone to know it. I had sung it all over the world to everyone from Camel herders in the Sahara Desert to the owners of a Vietnamese restaurant in Venice. No one outside of Canada and the United States had ever sung along. So you can imagine my surprise when the couple from Ireland shouted out Johnny Cash and joined in. Moments later we were joined by two young Chilean guys, the French couple and the Turkish girl. OMG…I was in heaven. JOHNNY CASH HEAVEN! 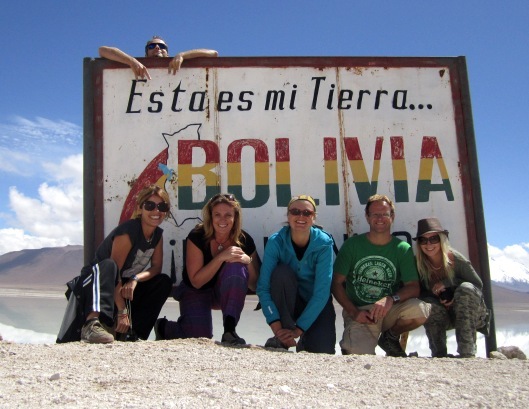 Never in my wildest dreams did I imagine that one day I would be staying at a crappy hostel in the middle of the Bolivian desert singing Johnny Cash songs with a bunch of fellow fans from all over the world. Talk about stepping into a big pile of happy. We wrapped up the sing-a-long with a round of Walk the Line followed by Ring of Fire and by the time we went to sleep our group and the six people from the other Land Cruiser had bonded into one big Johnny Cash loving family. One of my favorite sayings is, “it’s not the number of breaths you take but the number of moments that take your breath away” and this was one of those moments. I spent the entire first day occupying the front seat which was by far the best seat in the truck but by the second day I felt it was only fair to offer it up to someone else. The Frenchman, who was an avid photographer, jumped at the chance leaving me in the backseat near the window. Unfortunately the knob on the window was broken so I was not able to roll it down to snap pictures leaving me wish I had chosen the other side. I hate it when I do that…think that someone else has a better seat, a better meal, or a better whatever than me. I imagine being happier if I had what they had and then I just end up feeling unhappy. Why can’t I just be happy with what I have? I decided to just be happy where I was and trust that the Universe placed me there for a reason and that is when it happened. The Land Cruiser in front of us stopped in the middle of a gorge forcing us to stop as well. Looking out the window I noticed people taking pictures of two rabbit-like creatures. 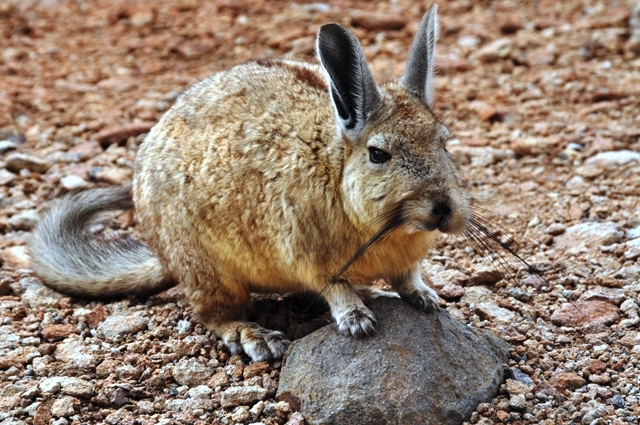 They were a combination between a rabbit and a chinchilla with long ears and long tails. I had seen a pack of them in the Argentinean desert but was not able to get close. I also spotted one at Machu Picchu but it also eluded my lens. This was my big opportunity. Since I couldn’t roll down my window to take a decent picture, I opened the door and crouched down to the ground. Seconds later the animals disappeared up the cliff and hid in the rocks leaving me without a single shot. The Frenchman in the front seat was able to get plenty of good shots while I got none making me feel even worse about having to sit in the back. I gave myself a mental slap upside the head and reminded myself that everything happens for a reason and it’s usually a good one. I was just about to admit defeat and return to my seat when suddenly one of the rabbits hopped back and stopped right in front of me posing nicely with its front paws on a rock and stayed until I got the perfect shot. Then it came right up to me and sniffed my hand perhaps hoping he would be rewarded. Unfortunately I had nothing to give him which is a good thing because we all know it is not good to feed wildlife as it puts them and us in danger. But it would have been hard to resist. T hat was one of the best moments in my tour and it reminded me to be happy with where I am at and what I have. In other words, the grass isn’t always greener on the other side and if it is who cares? 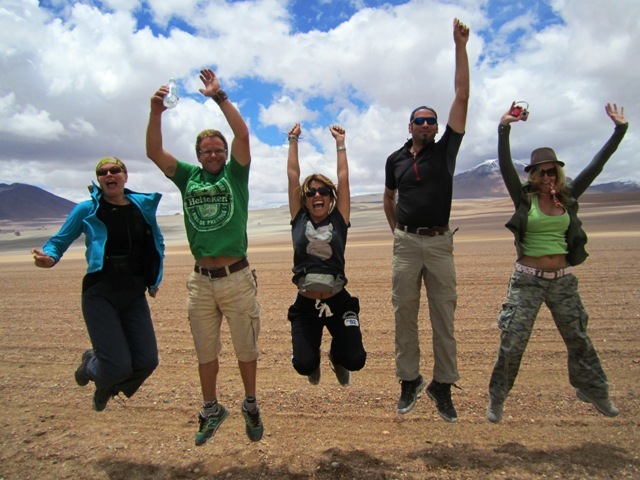 How to Get There - Uyuni is quite remote, you are best to fly into La Paz and take a bus or train to Uyuni.